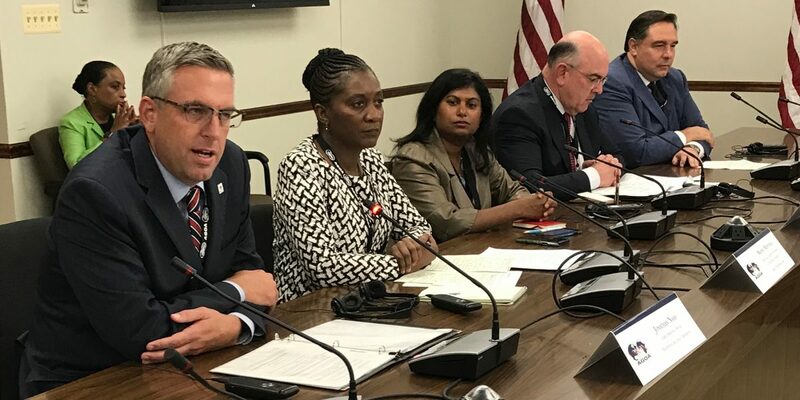 MCC COO Jonathan Nash participates in the Regional Investments: Unlocking economic growth and reducing poverty through regional integration, trade and cross border collaboration workshop at AGOA. Hello and good afternoon. My name is Jonathan Nash, and I am the chief operating officer of the Millennium Challenge Corporation. I would like to welcome everyone to our panel on Regional Investments: Unlocking economic growth and reducing poverty though regional integration, trade and cross-border collaboration. I am pleased that we are joined today by an excellent panel and my co-chair, Moono Mupotola, of the African Development Bank. Before introducing the panel and diving into the discussion, I wanted to first provide a few introductory remarks to frame the discussion. As you all are well aware, many of the world’s fastest-growing economies are in Africa. The continent will be home to one quarter of the world’s consumers by 2030. Growth in Sub-Saharan Africa is projected to reach 3.1 percent in 2018 and average 3.6 percent from 2019 to 2020. The continent can grow even faster when its countries are working across borders and connected to regional markets. Intra-African trade can help the continent’s industries become more competitive by creating economies of scale and access to larger markets. It can establish and strengthen product value chains and facilitate the transfer of technology and knowledge via spillover effects. It is clear that you all recognize the potential that regional integration can unlock, given the recent signing of the Continental Free Trade Agreement. I look forward to watching this process unfold and congratulate you all for crossing this important step to increase free trade, both regionally and globally. Regional trade can also incentivize and spur infrastructure development and attract foreign direct investment. And strategic investments in critical sectors can help the poorest people rise out of poverty – advancing security, stability and prosperity across Africa. Since the Millennium Challenge Corporation was created in 2004, we have invested more than $8.4 billion in Africa. Of that, MCC has provided nearly $4 billion in trade-related assistance to AGOA countries to support trade-related infrastructure like roads, ports and electricity, and to improve the productivity of export-oriented industries such as agriculture and small- and medium-sized enterprises. Our current portfolio in Africa accounts for 70 percent of all our investments, and currently includes Benin, Burkina Faso, Cote d’Ivoire, Ghana, Lesotho, Liberia, Malawi, Morocco, Niger, Senegal, Tunisia, and Zambia. Earlier, in June, I was in Liberia, where MCC’s compact with the country has helped rehabilitate the Mount Coffee Hydropower Plant, their single largest source of electricity. It is a partnership we’re very excited about and one with enormous potential to boost growth on the continent, help people lift themselves out of poverty and open up new opportunities for the private sector. Just last week, we were in Cote d’Ivoire, where MCC signed a $525 million compact last November designed to support the country’s long-term drive to diversify its economy and support the growth of the private sector through investments in a skilled workforce and by enabling people and goods to move more freely through Abidjan. And Ghana, where MCC is investing nearly half a billion dollars to transform the country’s power sector and stimulate private investment. Since MCC’s founding, our mission has been very simple—to reduce global poverty through private-sector-led economic growth. We have done that through our unique model that employs a transparent, competitive selection process requiring our partner countries to meet rigorous standards for good governance. We use a business-like approach that is committed to data, accountability and evidence-based decision making to identify and target the underlying conditions that constrain economic growth. The development and implementation of our compact programs are led by our partner countries, allowing them to take ownership of the process while refining their programs in consultation with the private sector and civil society. Until very recently, MCC only had the authority to engage in bilateral compacts with partner countries, but that has now changed. The AGOA and MCA Modernization Act that was recently passed in Congress and later signed into law by the president enables MCC to become an even more important strategic tool for the U.S. to help reduce global poverty and increase stability and security around the world, while supporting trade and creating opportunities for the private sector. This new authority helps the United States Government, through MCC, selectively target resources to promote economic growth, increase employment opportunities, support self-sufficiency of partner countries, reduce instability around the globe and strengthen U.S. national security. Through MCC, the U.S. will continue to promote data-driven investment, transparency, and accountability while encouraging private sector-led economic growth that reduces poverty around the world. MCC has an innovative and tested model that has already demonstrated the ability to incentivize countries to improve governance and their policy environments to support growth, while advancing economic growth by making investments within a country’s borders. By utilizing regional investments, we will help our partners achieve even higher rates of return and larger-scale reductions in poverty. The newly signed law will help MCC support new regional markets for trade and generate new investment opportunities, benefitting American companies looking to expand their businesses abroad, and mobilizing the power of blended finance to amplify the impact and sustainability of our investments. MCC’s new regional authority also supports economic growth and job creation here in the U.S.—one in five American jobs is tied to exports, and exports are an important driver in creating more, higher-paying American jobs. U.S. companies and investors are increasingly aware of the continent’s economic potential. In 2015, U.S. exports of goods to sub-Saharan Africa were $17.8 billion. Although this is a significant figure, the untapped potential of the African market and the ability of African firms to grow in the US market is what is most exciting. This is just the beginning: we know that there is much progress to be made in deepening our trade and investment relationship, and increasing trade flows in both directions. It is in the U.S.’s economic interest to strengthen our partnerships and support regional markets in Africa, Asia and across the globe. We anticipate regional investments for cross-border infrastructure projects in those sectors, though other sectors may be possible as well. MCC is ready to work with partner countries to identify and act on new regional opportunities. We are in the early days of identifying cross-border investment opportunities, and would welcome your thoughts and proposals. We will also engage with the private sector, as we do in all our compacts, to determine where and how our regional investments can have the greatest impact. We at MCC are very excited about the potential of regional investments to transform the lives of millions of people on the continent, and we will approach those investments with the same rigor and commitments to good governance that have been our hallmark. Thank you, again for joining us for what I am sure will be a very interesting panel. On that note, I would like to introduce Moono Mupotola, Director for Regional Development & Regional Integration at the African Development Bank. I am delighted to join her as co-chair of this panel. Moono and I had the pleasure of meeting in Abidjan just last week. I would like to request Moono to highlight why regional collaboration is critical for Africa’s economic success, what type of near term regional investment opportunities are out there, and what challenges she has experienced in designing and implementing such investments. In particular, can you please highlight the role international financial institutions, bilateral agencies, and the private sector can play in overcoming the regional investment challenges and realizing the opportunities for Africa’s economic growth.